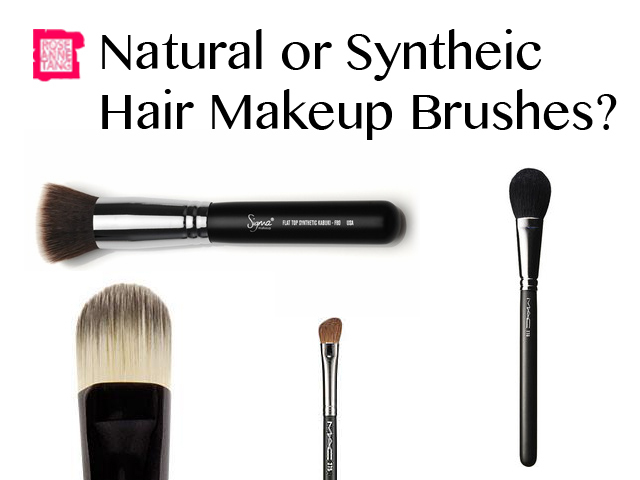 I get a lot of questions asking what should I get – natural or synthetic hair make-up brushes and the answer is, both. That’s because natural and synthetic hair is useful for different functions when it comes to applying make-up and both are essential to either your personal or professional make-up kit. Here’s the low down on both and what they’re great for. What is it? The bristles of the make-up brush is composed of hair that is synthetic and man-made. Often the hairs have a more smooth/slightly plastic feel to them. They are dyed to brown or a gradient brown and cream to white usually. What can it do? Synthetic hair is great for cream and liquid products – including foundation, cream blush, gel liner and concealer. It is able to not absorb so much of the product and apply a smooth finish onto the skin without much streaking. The hairs tend to gravitate toward each other in applying the product instead of spread out so it can help apply liquid and cream well. For any cream and liquid product including lipsticks, use a synthetic brush. Synthetic hair can also be more precise and the brush can be cut sharper so eyeliner can be made very precise. 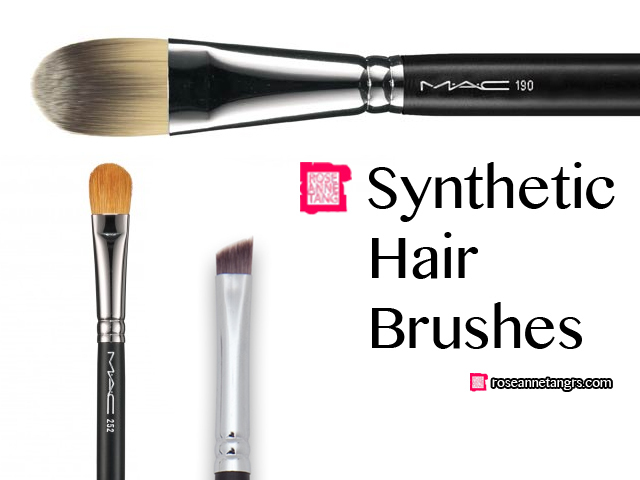 You won’t get any fly aways with a synthetic brush. Avoid synthetic brushes that are used for – Powder, eye-shadow, blush and bronzer. Synthetic brushes do not pick up powder well. What is it? The make-up brush is made of natural hair from an animal like a squirrel or goat. The hair is similar to our hair and is commonly soft and smooth and dyed black or white. Avoid getting straw feeling natural hair bristles that feel like they could poke you. What can it do? Natural hair brushes are the best for powder products – powder blush, face powder, bronzer and eye-shadow included. When the hairs are applied with pressure, they have more texture than synthetic bristles and therefore pick up powder well and blending is made easier and more natural on the skin. You can’t blend as well with synthetic bristles because the bristles don’t move as freely as natural hair bristles do. 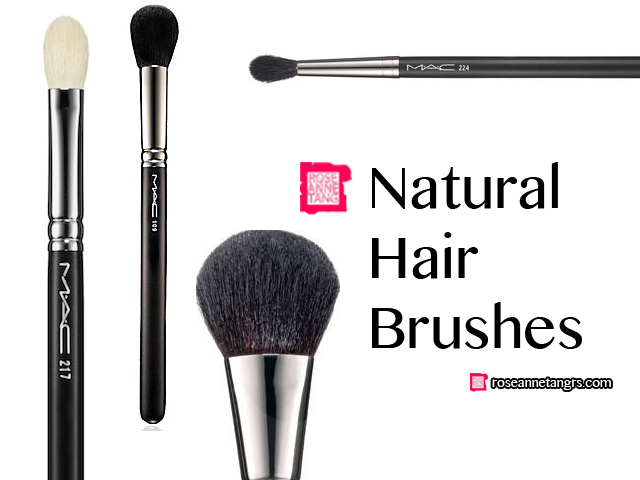 Best natural hair brushes to get – Eye-shadow brushes – MAC 217, blending brushes, paddle brushes. Also blush brushes like the MAC 116, contouring brushes and powder brushes. Avoid natural hair brushes that are used for – Foundation, concealer, lips and eyeliner. So there you have it! Hope you now know the difference 🙂 Let me know if you have any blog requests below! Would love to hear them! Anna Sui Inspired Fall/Autumn Make-up Tutorial & Ring Rouge Giveaway! Love the information you have here. Thanks for sharing, this is awesome. Hi Roseanne! Can you please let us know which powder brush you use to set your makeup? Thank you! I was enriched by every piece of word written here. I want to know if cleaning process varies for different types (synthetic, natural) brushes. Man I thought I knew everything about makeup. I never really paid attention to brushes. This is great information especially since I’m thinking of buying a new brush kit 🙂 thanks! Hi, Roseanne! I’m a big fan of your blog. I love doing smokey eyes for my monolid eyes. Sometimes I use pencil eyeshadow such as Laura Mercier Caviar Eye Stick and layered powder eyeshadow on top of it, and blending it. Do you have any suggestions what kind of blending brush I have to use? Natural or synthetic brush? And what brush do you suggest for me (brand to try)? So far I haven’t found a perfect brush for doing that kind of job.